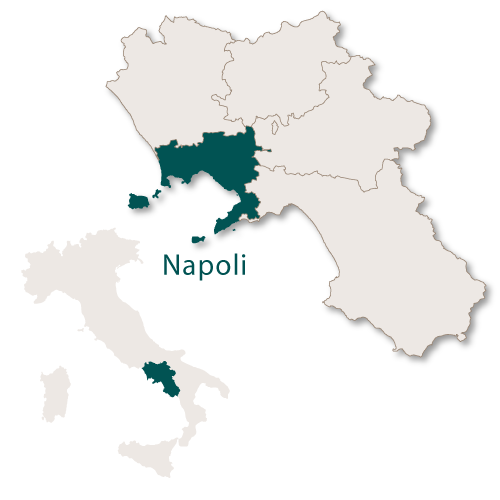 Napoli is the smallest of the provinces of Campania although it contains the capital city of the entire region. Including the islands, which are part of it, the province only covers an area of 1,171km. 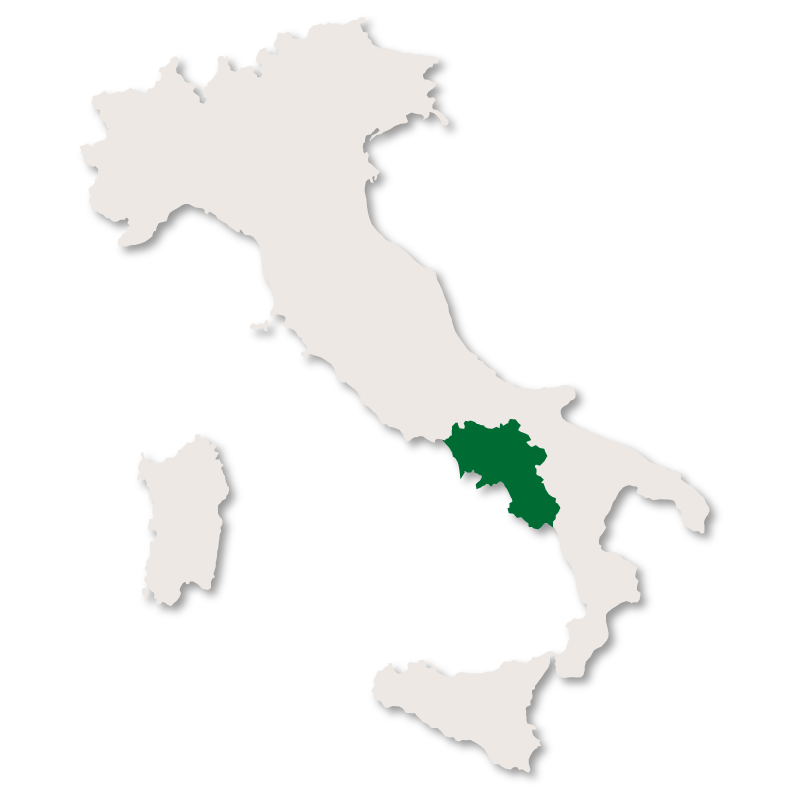 This represents less than 10% of the entire area of the region of Campania but more than 50% of the people living in the region live in this province. 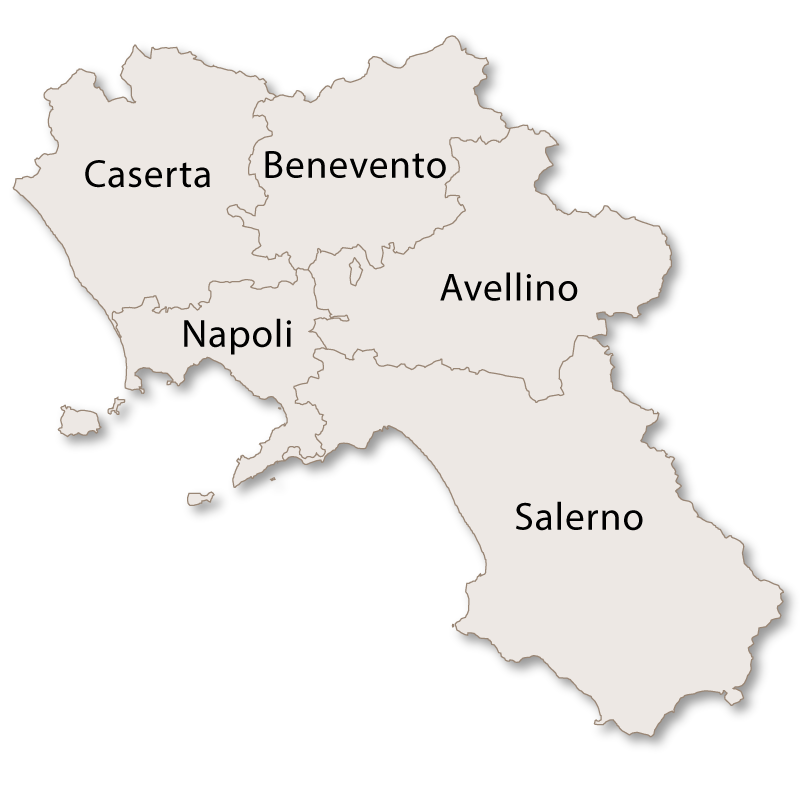 Napoli borders the provinces of Caserta and Benevento to the north, Avellino and Salerno to the east with the rest of the border running along the coast. 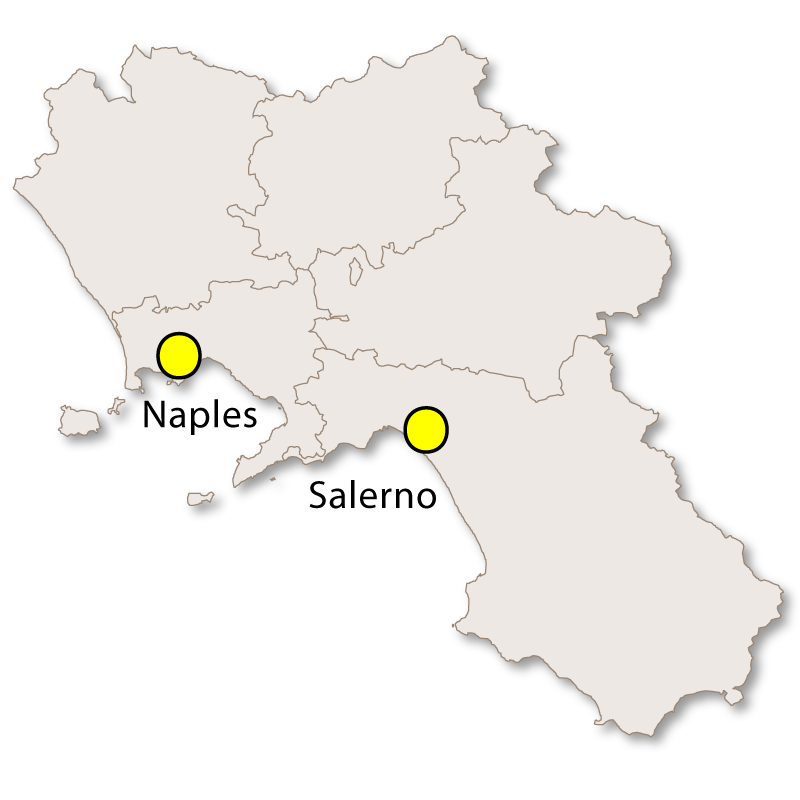 The whole province is completely dominated by the dormant volcano of Mount Vesuvius which looms above the whole landscape. This densly populated province is a peculiar mixture of beauty, unsightliness, nature, industry, noise and peace. It is perhaps one of the most fascinating areas of Italy with some of the most important historical sites and some of the most stunning scenery, villages and islands. Just south of Naples, at the foot of Mount Vesuvius, lies the town of Ercolano which was built on top of the volcanic residue around the ancient city of Herculaneum after it was destroyed by the eruption of vesuvius in 79 AD. Evidence of the remains of Herculaneum first came to light in 1709 and digging began to uncover it. Work was slow but due to the materials used at the time it is very well preserved. 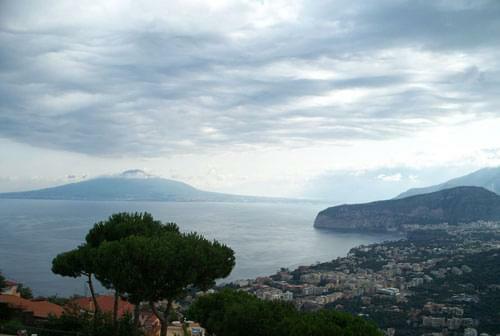 Ercolana is the starting point to visit Herculaneum and also the place to catch the bus to the summit of Vesuvius. The Basilica of Santa Maria a Pugliano which is in Piazza Pugliano and is the main church of the town and the oldest in the province. It has a belfry which is 36 metres high and some remarkable art treasures inside. Il Miglio d’Oro (The Golden Mile), a stretch of road leading from Herculaneum to Torre del Greco which is completely lined by lavish villas. This town is one of the oldest in the region of Campania and can be traced back as far as the year 332 BC. It was totally destroyed by Hannibal in 216 BC but rebuilt in 210 BC. 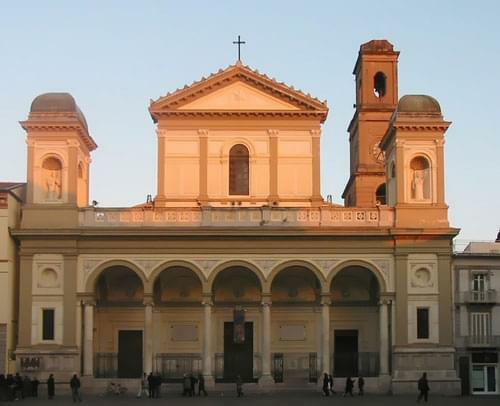 Acerra Cathedral which was originally built over an ancient temple of Hercules but was rebuilt in the 19th century. 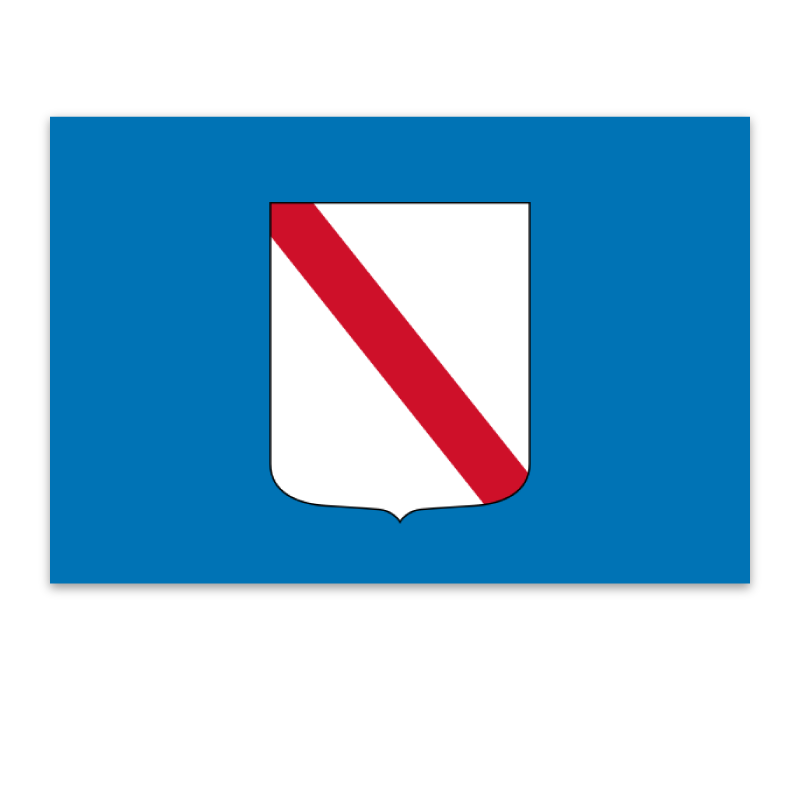 It is annexed to the Bishop's Palace. The Archaeological site of Suessula. Three interesting churches, Church of Corpus Domini (16th century), Church of San Pietro (16th century) and the Church of Annunziata (15th century) which houses a 12th century crucifix. One of the larger towns in Italy, Afragola has some historical buildings that are worth visiting. The Basilica of St Anthony where building work started in 1633 but the bell tower was built earlier in 1590. The castle which was built in the early 15th century. It is now a school. Palazzo Migliore which built in the 17th century. Church of Santa Maria d'Ajello (1190). Church of San Marco in Sylvis (1179). Church of San Marco all'Olmo (1615). Nola is an important town in the province of Naples which is situated on the plain between Mount Vesuvius and the Apennines and is close to the city of Naples. The Gothic cathedral which was restored first in 1866 and then again in 1870 after the interior was destroyed by fire. Basilica di San Tommaso which was originally built in the 3rd century but it has been renovated since then. Inside it has some frescoes dating back from the 9th century. The frescoes all depict different stories of Christ. Basilica of SS. Apostoli which was originally built in the year 95 AD and then rebuilt in 1190 it was the city's cathedral until 1593. It was redecorated in the Baroque style in the 1740. Palazzo Orsini whichwas built in 1470 but it has been modified a few times since then. The church of San Biagio is a late Renaissance church which is decorated with polychrome marbles and paintings from some of the most renowned 17th century Neapolitan painters. Close by to Nola is the Castle of Cicala. During the 1944 eruption of Vesuvius, Ottaviano suffered significant destruction but is now home to the head office of The Vesuvius National Park. Since 1946 the town of Pozzuoli has been the home of the Accademia Aeronautica, the Italian Air Force Academy, on a purpose-built hilltop campus overlooking the bay. From August 1982 through to December 1984 this seaside town suffered from hundreds of tremors and bradyseismic activity which, at its peak in October 1983, damaged 8,000 buildings in the city centre and left nearly 36,000 people homeless. These series of tremors also raised the sea bottom by almost 2 metres which meant that the bay became too shallow to accommodate large vessels. 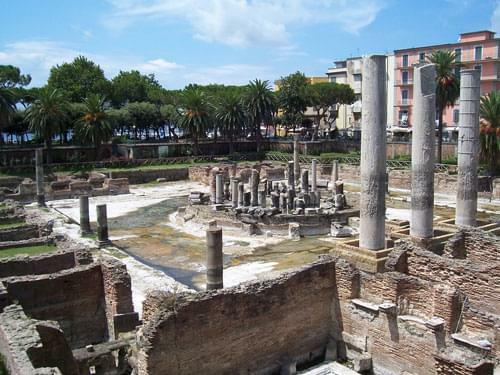 The Macellum of Pozzuoli which is also known as the 'Temple of Serapis' and is considered to be the city's symbol. It was one actually a marketplace and has three magnificent columns made from cipolin marble. The Flavian Amphitheater was the third largest amphitheatre in Italy after the Colosseum and the Capuan Amphitheatres. The Minor Amphitheater is close to the Flavian Amphitheatre and is somewhat obscured by other buildings. Much of it, including the arena, is still buried. The Puteoli's Baths are also known as the Temple of Neptune and were once a large thermal complex. Villa Avellino is an urban park with several Roman ruins, water tanks and a Roman 'face' fountain which is still in working order. The Necropolis of Via Celle is a complex of tombs and mausoleums near to the old Roman Road Via Cupa Cigliano. 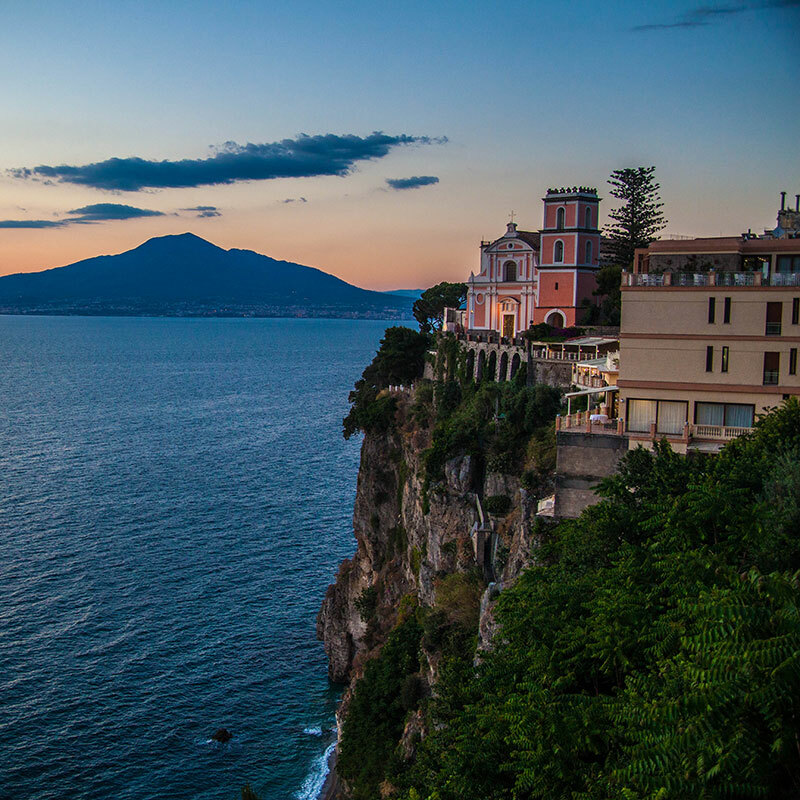 Not far from Naples and overlooking the Bay of Naples, Sorrento is a pretty seaside town which is now a popular tourist destination. 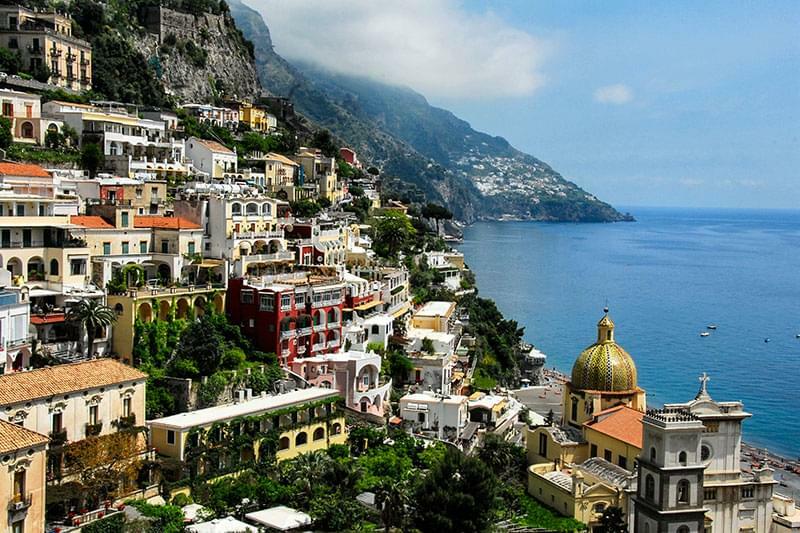 It is connected to the town of Amalfi by the famous 'Amalfi Drive' which is a hair raising, narrow, twisting road high above the Tyrrhenian Sea. 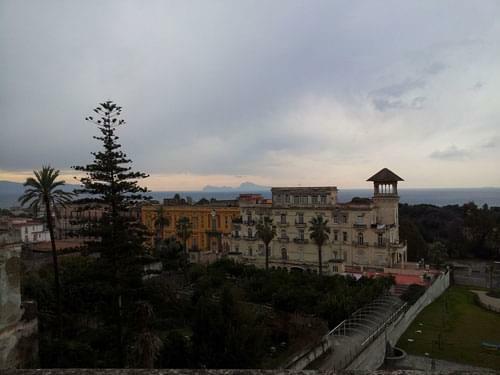 It has two ports, Marina Grande and Marina Piccola and wonderful views across to the island of Capri, along the Amalfi coast and of Mount Vesuvius. The town is not large but has a pleasant, lively atmosphere and is a perfect holiday destination. There is an abundance of bars and restaurants, good shops and many local craft shops with excellent produce. Ferries run from here to Capri, Positano and along the Amalfi coast. Sorrento is famous for the invention of and the production of limoncello which is a digestivo made from lemon rinds and alcohol.